Indication of hypogammaglobulinemia in foals: Hypogammaglobulinemia can arise if there is none, or very little, intake of colostrums or if the IgG-levels in the colostrums are low. It can also arise if the mare releases her milk prematurely, resulting in leakage of milk for more than 24 hours before arrival of foal. Dosage: A liter of plasma can be given to a foal weighing between 30 and 50 kilos (20-40 ml/kg per day). Storage and transport: Store in freezer at a minimum of -18 Celsius. If the plasma has been defrosted during transport it can be refrozen immediately or be stored in a fridge for two weeks, assuming the plasma is unopened and has not been heated to body temperature. Repeated cycles of freezing and reheating can damage the effect of the complementary proteins in the plasma. Plasma that has been defrosted and heated in thermal bath (about 40 degrees Celsius) should be discarded if it is not to be used. Damaged bottles should also be discarded. Handling and administrating: Defrost and heat the plasma by placing the bottles in a thermal bath of 40 degrees Celsius. This should take between 10 and 20 minutes. Keep adding warm water to the thermal bath to keep the temperature steady. Do not defrost in microwave and do not use water over 40 degrees, this can damage the plasma. Plasma heated to body temperature should not be refrozen. Plasma heated to room temperature can be refrozen. The plasma can be administered orally if the foal is between 12 and 24 hours old, usually through a probe or a feeding bottle. The colons ability to absorb larger molecules, such as immunoglobulin, diminishes and disappears after 12-24 hours of age. It is also recommended to administer the plasma orally if the foal is suffering from diarrhea due to a rotavirus infection, for a localized effect of antibodies in the colon. A supplied aggregate is to be used when administering the plasma intravenously. It is important to remember to clean needle-inlet of the bottle with alcohol before placing the aggregate. A liter of plasma is administered to the foal during 15 to 20 minutes. Ongoing infections consume antibodies at a fast rate; therefore repetitive administration of plasma can be needed. If needed, an additional liter can be given 12-24 hours later. A slower administration of plasma can be needed if the foal is weak or generally effected by illness. Administering the plasma too quickly can result in hyperventilation, tachycardia and sweating. If this should occur, administration rate should be severely reduced or stopped completely if the symptoms do not abate quickly. 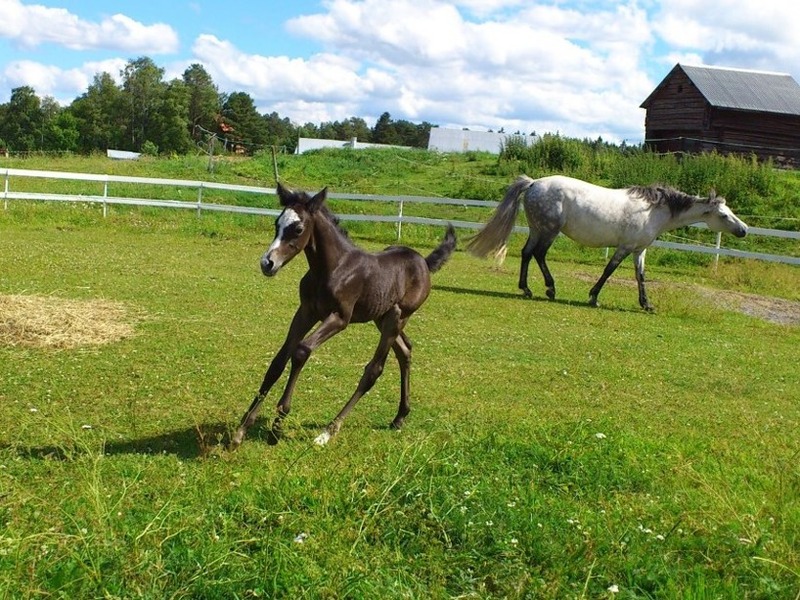 Neonatal foals are generally more sensitive to treatment. Durability: Three years from control date, if stored at at least -18 C.
Packaging: 2x500 ml plastic bottles with needle inlet or 1x1000 ml plastic bottle with needle inlet. Aggregate for infusion with filter is included. A test to deduct the IgG-levels in the foal can be included as well. Controlled production of plasma for foals: Håtunalab only produces plasma from our controlled, well tested group of horses. Routines, ethics and controllability are of highest importance. With the help of the batch number the product can be traced throughout the production chain from beginning to end. Only selected horses donate plasma for foals. These horses have been tested to make sure they do not carry certain viruses, such as; equine rinitvirus type B, equine arteritic virus, equine influenzavirus A2, equine herpesvirus or antibodies against erythrocyte antigenes (which causes severe anemia in the receiving horse). Our horses are regularly vaccinated for influenza, botulism and tetanus. After donation, the approved plasma is pooled and filtered. The plasma is then tested to make sure there are neither contaminants nor endotoxins. Also the viscosity and the pH-value are tested before it is released to the market. Only plasma containing high levels of IgG and antibodies for influenza, tetanus and botulism is approved. Our strict routines result in plasma with a high and even quality.